Truro & Penwith College offer new apprenticeship programmes that in partnership with the Eden Project. GetMyFirstJob have been working with Truro & Penwith College since 2015 helping them place candidates in apprentices. Now Truro and Penwith College and the Eden Project are launching apprenticeships in two new subjects. The college is a key strategic partner for apprenticeships at Eden and both already support apprentices in Business Administration and Marketing. From September the outstanding-rated college and Eden will also start offering two new programmes in Hospitality and Human Resources. Eden is one of the UK’s top 100 Apprenticeship Employers accredited by the National Apprenticeship Service and has been awarded a number of accolades for its work-based training including Large Apprentice Employer of the Year at the 2017 Cornwall Apprenticeship Awards and Outstanding Commitment to Apprenticeships at the 2017 Cornwall's Excellence in Business Training Awards. Truro and Penwith College recently added the award of AoC (Association of Colleges) National Leading Light Beacon College to its Gold TEF (Teaching Excellence Framework) and Ofsted Outstanding ratings. Dawn George, Director of Human Resources at the Eden Project said: "Eden has worked with Truro and Penwith College over many years for a number of training and apprenticeship requirements and we are proud to continue that relationship with the 2018 cohort of Eden Apprentices." “Partnerships with organisations such as the Eden Project allow us to build upon our commitment to working with Cornwall’s top apprenticeship employers, who offer our learners a quality experience and an exceptional start to their careers”. The majority of apprentices who have trained with Eden since its programmes began in 2014 have either progressed straight into full-time permanent employment or have successfully gained places in full-time education. 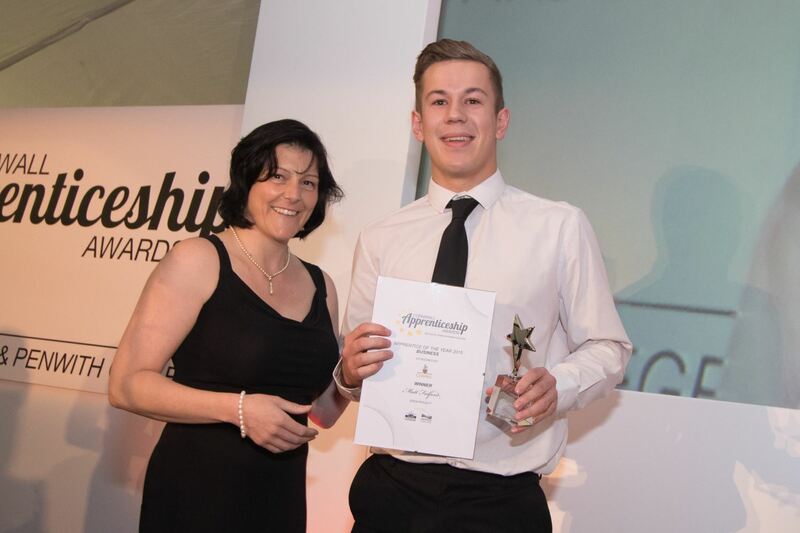 Matt Fulford, Business Apprentice of Year at the 2015 Cornwall Apprenticeship Awards, studied an Apprenticeship in Business Administration at the college and started his career in Eden’s human resources team. qualifications to develop his career, now allowing him to study at university level. He said: “Eden has supported me through all stages of my journey, equipping me with the skills and knowledge required to further my career. They have invested time, effort and money for development beyond what is required for completion of my apprenticeship, and that is what I believe makes the Eden Apprenticeship programme shine above others. For help and advice contact the College’s Apprenticeship team on 01872 242711 / apprenticeships@truro-penwith.ac.uk.